Congrats On Your Nicheology Membership Investment! You Made An Excellent Decision! We Have One More Special Offer For You! If You Want To Follow A Proven Plan For Getting Traffic To Any PLR Product, Than You Will Want To Read This Page Now! opportunity to explode my traffic for my information products. You understand that, right? You are limited in what you can do. It doesn’t matter how prolific, how productive, or how efficient you are, there is a max-out point where you can do no more. When it comes to running your business, you only have so much time and resources at your disposal. You – personally – can take your business to a certain level of potential on your own, but not beyond that level. To go beyond your limitations, you need other people. Affiliates. Partners. Whatever label you want to attach. Whatever you can do, a dozen people just like you can do more. Or, a thousand people doing just a portion of what you do, will significantly grow your business. You are about to learn how to “earn 1% off a 100 people’s efforts”. Actually, it’s better than that. Your cut will be 50% instead of 1%. And, it will come from potentially thousands of “people’s efforts”. Do you understand why Rockefeller said what he said? The profitability of a network of partners can be deep and wide. Done right, it’s literally the only traffic source you will need. Ever. You’re in a big rowboat all by yourself, and you’ve just launched off the shore. There is water as far as the eye can see. You need to row across this vast expanse of water all by yourself. You have no idea how far it is or how long it will take. You start rowing. The first hour goes well. You get a rhythm down. It’s easy. Row, row, row… quick, quick, quick. As you enter the second hour, you slow your pace. Rowww, rowww, rowww. Don’t want to burn out too fast. Hours pass. The sun is starting to set. You grow weary. You spend more time floating than rowing because you’ve reached your limitations. You know you’ll eventually get to your destination, but it’s not going to be anytime soon. Wouldn’t this be a lot easier with a team of rowers helping you out? Are you rowing your business forward all by yourself? Because the same thing happens in a business as in a row boat—you have limitations. There is a certain point you simply can’t go forward on your own. You need help. Not just one or two other people. I’m talking a team of the best people around. Think of rowing races you see on TV. There’s that one guy sitting in the front of the boat directing a team of strong rowers as the boat practically flies across the water. That could be you in your business. You could be the guy sitting in the front, encouraging the rowers, navigating, and reaping all the rewards. Imagine having the biggest super affiliates in your niche promoting YOUR product. Imagine how much money you’d make if the most well-known marketers teamed up with you. This is the power of partner traffic, and the sky is the limit! You can only do so much on your own ... but a team can do a virtually unlimited amount on your behalf. That's the power of what I'm talking about here. I can tell you this - I don't worry about traffic. And you shouldn't either. When you have a network of affiliates and partners in place, traffic is automatic! 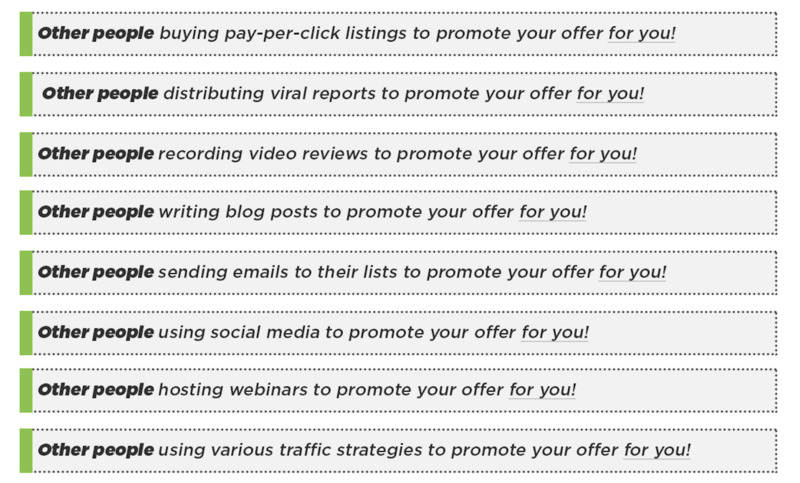 By now, you've probably tried every "traffic generation" gimmick on the planet, right? There is no need for you to keep spinning your wheels trying every new shiny object that comes into your inbox. All you need is ONE source of traffic ... partner traffic. Let other people use all of the various traffic generation strategies on your behalf! The traffic is highly responsive. Your marketing partners have spent months or even years developing relationships with their newsletter subscribers, social media followers and blog readers. So when they promote your product, it’s like these prospects are getting a recommendation from a good friend. They totally trust your marketing partner. And that means partner traffic can create some off-the-charts conversion rates for you! If your partner traffic strategy is focused on your affiliate program, then you only need to share a commission with your partners after they make a sale and put money in your pocket. That means you can use partner traffic even if you have zero dollars in your advertising budget! Best of all, there are plenty of ways to take advantage of partner traffic which are totally FREE. No commissions, no payments, no fees. Just lots of high-quality traffic flowing into your site for free! Your traffic grows over time. If you use paid advertising, you always need to pay more money to get more traffic. Once you’ve landed a partner and developed a good relationship with that person, he or she will keep sending you traffic and sales for years to come. Just drop an email to your affiliates when you launch a new product, and you’ll enjoy a huge sales surge. It’s crazy how well it works! Best of all… as you make more sales, affiliates start finding YOU. They’ll clamor to join your affiliate program. They’ll beg to partner up with you. And your traffic grows naturally and exponentially over time as your affiliate program blossoms! How do you find good partners? How do you convince them to join your team, especially if they’re in-demand super affiliates? How do you motivate them to keep promoting for you long after a product launch is over? When I say “in depth,” I mean it. This isn’t a skimpy report. This isn’t a flimsy ebook. This is a meaty 150+ page guide that gives you the no budget, no out-of-pocket cost system for getting other people to send you traffic. This course curriculum and accompanying three-hour audio guide includes step-by-step instructions, plus you’ll get dozens of examples, tips, mini-blueprints, templates and ideas for successfully getting website traffic at no cost to you through affiliate and joint partnerships. Simply put, you won’t find a better or more comprehensive course that gives you absolutely everything you need to start driving more traffic, generating more sales, and making more money with partner traffic. This jam-packed course includes four modules that cover everything you need to know about this strategy. It’s best suited for beginner and intermediate level marketers, but even the seasoned vets will find gold nuggets inside this course. Inside this module you’ll get step-by-step instructions for these three important pieces: 1. Setting up your affiliate tracking, 2. Getting your affiliate center ready, and 3. Creating an affiliate attack plan. You’ll find out the main two options you have for setting up your affiliate partner program--some people don’t even know the second option exists! You’ll learn the pros and cons of the top three affiliate platforms so you can make the right choice for your business! You’ll discover the #1 mistake new affiliates make that costs them a HUGE amount of money—check out this module to avoid this expensive mistake! Why every affiliate program needs an affiliate center—and how you can gets yours set up quickly and easily! The 9 key items you need to put in your affiliate center if you want all your affiliates to promote as much as possible! The three types of affiliates who’ll join your affiliate program, and how to coax the biggest amount of effort and profit out of each type! You’ll get a complete recruitment strategy, including sample emails, phone scripts, and everything else you need to land a deal with the biggest affiliates in your niche! Bottom line, this module is where the magic happens! So what do you do once you have a team of super affiliates and other marketing partners who are eager to promote for you? The #1 worst way to launch a product—don’t use unless you want an embarrassing trickle of sales! You’ll learn the four keys to a great launch (miss just one of these, and you’ll be leaving a lot of money on the table)! You’ll find out which five types of launches really work to jam your order form with sales… plus you’ll get a complete step-by-step blueprint for each type! You’ll discover the best way to get your prospects hitting the order button the minute your product launches! Who else wants server-crashing launches? Check out the Sideways Sales Letter blueprint inside this module to find out how to build anticipation and whip your prospects into a buying frenzy come launch day! You’ll discover a different launch strategy that gets your entire industry buzzing about your product weeks or even months before you launch! You’ll find out what the Sampler Launch is, and how to use it to build a lot of pre-launch anticipation for your product! You’ll discover how to use the Sales Funnel Launch to create a big launch, plus sales that keep flowing for weeks and months to come! Now this is cool: you’ll find out how to create an invitation-only launch event that makes your product go viral in a huge way! You’ll learn the two secrets of renewing interest in old products—this is a great way to get the sales flowing again long after the launch excitement has died down! Plus you’ll find out my personal system for getting affiliates to work super-hard and promote your product like crazy! From launch strategies to keeping the post-launch sales flowing in, this module has you covered! You’ll find out how to turn your affiliate program into a hands-free profit center! You’ll learn the keys to getting other people to publish your content on their popular, high-traffic blogs—you’ll even get an email template that’s sure to land you many lucrative opportunities! You’ll find out how to borrow credibility from the top authors, experts, and marketers in your niche by co-creating content such as webinars, reports, ebooks and even interviews! You’ll discover two clever ways to get your offer in front of proven customers using partner traffic! You’ll find out what a “ride along” is and how you can use it to drive cash-in-hand customers directly to your order form! You’ll get a smart step-by-step strategy for teaming up with other marketers in your niche to grow your list by leaps and bounds! And much more. By the time you finish this module, you’ll see that the sky is the limit when it comes to growing your business with joint venture partnerships! Some say the very best part of the course are the seven supplemental accessories. That’s because these accessories provide you with all the tools you need to put partner traffic to work for you. You’ll get dozens of templates, examples and ideas to make quick work of getting more partners and more sales! Now anyone can land super affiliates, marketing partners and other joint ventures using these templates. You get 20 in all, one for every blueprint shared in the course! Template #3: Personal invitation template to use after you’ve interacted on social media (see page 59 of the course for the complete strategy). Chat on Facebook, send this template… easy! Template #5: Interview request email (goes with the step-by-step blueprint that’s taught on page 64 in the course). This is a great way to get your name associated with the “top dogs” in your niche! Template #7: Email for requesting a big favor from a partner (see page 69 of the guide). Template #10: A follow-up email to send after you’ve shipped a product to a prospective partner (see page 73 of the course). Heads up: most people don’t buy the first time they encounter an offer. They need to hear about it multiple times. And that’s why sending a sequence of emails all promoting the same product tends to really rev up your sales and boost your conversion rate. You’ll find out what four things your email sequence needs to do if you want to start closing a lot more sales! You’ll learn the three crucial factors you need to include in every email to generate more orders! Template 1: The Freebie Email. This email triggers reciprocity and gets more people into your sales funnel! Template 2: The Special Bonus Email. This email will get your prospects clicking your order faster than ever! Template 3: The Story Email. Use this when you want to drive sales by engaging your readers on an emotional level. It works like crazy! Template 4: The Overcoming Objections Email. Your prospects are actively looking for reasons to NOT buy your product. This email overcomes those objections and gets more sales flowing your way! Template 5: The Social Proof Email. Your prospects don’t believe you. They’re skeptical. This is the email you use to prove your claims are true… and generate a whole lot more sales in the process! One of the absolute best ways to turn a prospect into a cash-paying customer is by offering them a freemium – and this accessory gives you 25 proven ideas with dozens of examples! You’ll never run out of freemium ideas when you have this amazing list at your fingertips! Whether you’re creating content for a blog, social media platform, newsletter or anything else, you need to keep your readers engaged. And that means providing them with a variety of fresh articles. Writing an article is easier than ever when you can tap these blueprints! Text content is a great way to presell, but sometimes the best way to generate sales is with a video. And this exciting report shows you five different ways to turn a video into the very best sales person on your staff. You’ll even get minute-by-minute outlines of what to include in your videos! Videos are all the rage right now, so find out how you too can profit with videos by reading this report! That vast majority of business owners will fail if they don’t put a sales funnel in place. Don’t become a fatality—instead, use this accessory to discover the secrets of creating a $100,000 sales funnel. You’ll find out how to create a profitable and effective sales funnel with as few moving pieces as possible—this is a $100,000 sales funnel made easy! You’ll get multiple examples and paths to $100,000. it’s probably a lot easier than you think – just wait till you lay your eyes on these examples! Every step includes in-depth instruction and details so you can put this system to work for you starting right away! When you think of joint ventures (JVs), you might think of an affiliate partnership. One person brings a product, one brings traffic, and they both make money. Product creation: This includes creating audios, reports, live events and more. These clever JVs will get your name associated with the biggest stars in your niche! Traffic generation: If traffic is the lifeblood of your business, then these ideas will give your business a huge transfusion. These are amazing ways to get lots of highly responsive visitors who can’t wait to buy what you’re selling! List building. You won’t find a better way to build a list than through these amazing JV ideas. If you want a big list fast, these are the ideas that are going to set your heart pounding with excitement! End result? You get free content, free traffic, free subscribers, and tons of sales! You’ve seen other comprehensive marketing courses that have gone for hundreds of dollars a pop. I’m talking $397, $497 or more. And you know what? You don’t have to pay that much for this course, even though it would be well worth every penny if you did. Imagine if this course gave you the training and tools you need to land just ONE decent affiliate. Now imagine this affiliate makes 20 sales for you of a $50 product. You give the affiliate a 50% commission, so you both pocket $500. That’s pure profit. I’m sure you’d gladly play $250 to learn the secrets of landing affiliates who put $500 in your pocket over and over and over. Now imagine if you land a super affiliate who can make 50 or 100 sales for you. Picture your inbox filling with sales notifications every time you launch or relaunch a product. Truthfully, I could name my own price on this one. It could, quite literally, be worth a fortune. The system I share in this course is responsible for millions of dollars in revenue. To put a "fair market" price tag on it would be out of reach for virtually everyone reading these words. So, the real question for you to answer is: what is one good affliate / partner worth to you? How much money could they make for you in a month? In a year? In a lifetime? What about dozens or hundreds of partners promoting your products over the coming months and years? How much would an entire network of marketing partners be worth to your business? I think you’ll agree that’s a really great price. Because as soon as you land one good partner using the strategies and tools you’ll find in this course, you’ll recoup your investment and start pocketing a profit. P.S. This is the best and fastest way to find out how top marketers build huge affiliate programs and land the biggest joint venture deals around. Now you can swipe their proven strategies and email templates for your own use! Order now to get started! P.P.S. The only thing you need to think about right now at this moment is the number ONE. Seriously, think about it: ONE good affiliate doing ONE promotion for your ONE product will most certainly make more money for you than the low-cost of this course. Imagine the potential of an entire network of marketing partners doing multiple promotions. Enough said.